If you are really into authentic Latin rhythms and beats like salsa, cumbia and bachata and your kids share your musical taste, then you will definitely be into the Chakuchukuchá vibe. This CD was created by Gloria Rojas, a bilingual speech/language pathologist, who, based on her own experience as a child immigrant having to quickly learn a new language, created a program to teach children a second language through the effective use on songs, sign language and movement. And what better rhythms to get the whole familia dancing than Latin music! 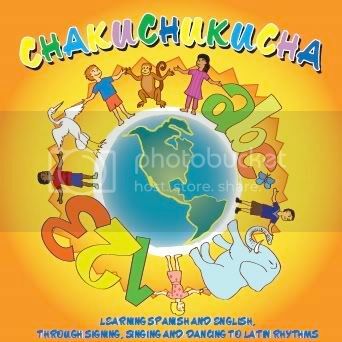 For Chakuchukuchá, Gloria created 8 songs in Spanish and the same 8 songs in their English version, perfect for budding bilinguals, as well as ESL students. The themes of the songs are very basic as the intent is for children to learn through these lyrics standard vocabulary and phrases such as colors, the alphabet and zoo animals. If you´re from Puerto Rican descent you might quickly smile when listening to the title track Chakuchukuchá and recognize the famous clown, Payaso Remi, leading the vocals of this cumbia song. You can find a copy of this CD over at CD Baby and you can always try to win one here. This giveaway is now closed. Congratulations to the winners: Gingerannbeck and Angelina. We’re giving away one copy of Chakuchukuchá to a lucky winner. All you have to do is leave us listen to the samples of the songs here and tell us which one you like. This giveaway ends Sunday, April 11 at midnight EST and you must have a valid US address to enter. I like Los animales del zoológico. And I already subscribe to your RSS. 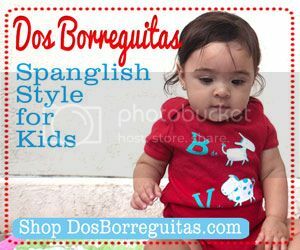 My daughter is starting a DL school in the fall and I’m trying to learn Spanish as fast as I can! So hopefully this CD will help me too. I loved all the songs, gets you moving all the while learning! I like the Los colores song! Thank you Ana for posting this and I like your terminology “Chakuchukuchá vibe”. Actually, if you want to know where the word Chakuchukucha came from….. I was looking for a way to say Boogie Woogie because that’s one of my English version songs and when I sat down to write the Spanish version I thought to myself, How would I say, “Boogie Woogie” in Spanish??? It’s not easy. That evening, at about two in the morning, while listening to an interview on V-me, they were interviewing Willie Colon because El Cantante (homenaje a Hector Lavoe) was coming out in the movies. They aired the song, La Murga (GREAT SONG btw) and if you listen carefully you’ll hear them jamming and singing something about Chakuchukucha. I thought, “that’s it, I’ll take it”. Lannie Battistini, my composer/arranger loved the idea. We proposed it to Remi el Payaso (the clown from Puerto Rico) to see if he’d do the vocals and there you go. Love the story, Gloria! Chakuchukuchá sounds much more fun than Boogie Woogie..each with it´s own “vibe” for sure! I like Los Colores. I subscribe via RSS. .-= livesimplylovestrongly´s last blog ..Repurposing project #4 =-. Arriba, abajo, y alrededor is our favorite, but we like them all! I’m already a RSS subscriber. I like Los animales del zoológico because it isn´t just the animals names but characteristics of the animals. How can we hear the tracks? Is there a MySpace page or another site that has streaming so we can listen to it? Peggy, you can preview the songs on CDBaby and I am also set up for international distribution. You can preview Chakuchukucha CD and I just realized my next CD “Manitas” in Motion Sing along and Sign is up on Amazon MP3, iTunes U.S. iTunes Mexico, Napster, and numerous other internet stores. Just type in Gloria Rojas. This is all new to me. A MySpace page would allow you to listen to the complete song, is that it? I’ll have to look into that. 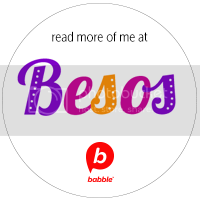 I loved the abecedario song! .-= Adriana´s last blog ..Toys my children ACTUALLY play with- Stamp set =-. I like the colors song too. As well as the Chakuchukucha song. 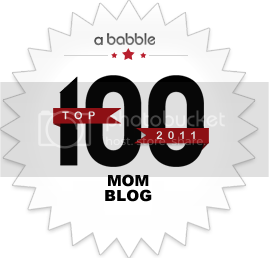 .-= Julie´s last blog ..Ordinal Numbers =-.